Employers and students networking at ROMP. Each year MAFP and the Office of Mississippi Physician Workforce together host the Rural Opportunities for Mississippi Physicians (ROMP), a spring career fair for medical students to learn about rural job opportunities and meet potential employers. 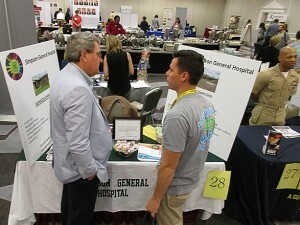 The event is held in connection with MAFP’s Spring Conference, an educational event for practicing physicians, and MAFPF Spring Fling, an event specifically for residents and medical students.